Salsa Rocks are delighted to bring back Emil Prysak to Leeds for his awesome Spins, Turns and Isolations workshop!! This three hour workshop, aimed at both leaders and followers, will help you work on your multiple spins and turns with emphasis on improving balance, control and generating your own momentum to make your spins smooth and effortless. You'll also work on isolations that help you express the music without interfering with your leading or following. First a massive thanks to everyone who came to our first party :) it was such a rocking success that when you said more! we said YES! Please do invite your friends to make this one bigger and better! Salsa Rocks proudly presents our SECOND installment of "Salsa Rocks Grande" - A very special Salsa party, in our fantastic venue complete with FULLY SPRUNG WOODEN DANCE FLOOR, Fully licensed bar, and an upbeat friendly vibe, right in Leeds City Center! In preparation for the Cha cha workshop with Sam "Mr Sleek" (10 Oct), we bring to you a Cha cha Timing and Fundamentals Workshop with the Salsa Rocks team. 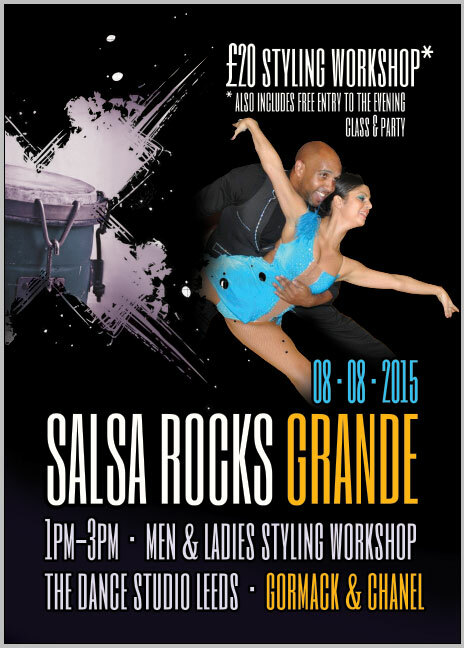 Read more: Salsa Rocks Grande - Setting the dancefloor on fire! Read more: Viva Brewery Wharf with Salsa Rocks Leeds!